The Stroke Awareness Inspire Ring Necklace - Red is a great way to show awareness for many causes, such as Stroke Awareness. 1" silver-tone* open circle is engraved with the powerful words; Faith, Hope, and Love. In between each word is a red colored ribbon that represents the cause. 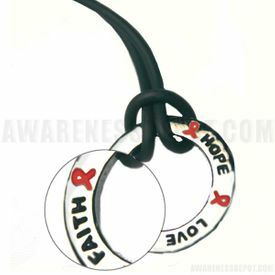 Each circle hangs on a black satin 17" cord with an easy-to-use clasp. This is a great way to show your support for Stroke Awareness. Satin 17" cord with easy-to-use clasp.